Pushpanjali ensures equal and fair wages, promotes cultural wealth and fosters training to build capacity. Kasum is an example of how effective training and a digniefied work can help develop personal and professional skills which pave the way for long term economic empowerment. For a woman to be economically empowered, and thus have financial stability, also means to achieve a higher social independence. Fair Trade organizations provide opportunities for women to acquire the know-how and skills which represent fundamental assets in a globalized and fast-changing business environment. 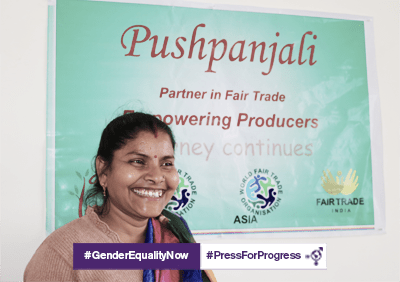 Kusum is working with Pushpanjali Fair Trade “PFT” since August 2012. Kusum started working with PFT as packing helper, she got training time to time and slowly she started working on scarves and now she is a group leader of women scarf group. Before joining PFT she was a housewife and at that time she was unable to send her children in good school to get good education. Then she contacted PFT where she could learn and get training to work, receive equal fair wages, work with dignity and provide to her family needs. She works in the scarf group as a leader and has a knowledge of processes starting from cutting, tailoring, labelling, tassel making and stitching. Now she also provides training to other women, so that these women can also learn the processes and get the work. Now Kusum's children are getting good school education. During the recession in 2017 her husband lost his job but thanks to her earnings, they were able to live decently.